The making and showing of movies like “Alien Uprising” should be prohibited by law !! This was just terrible. 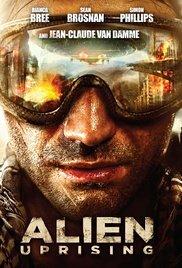 “Alien Uprising” will go down in history as one of the most annoying and meaningless movies ever. And don’t forget to mention the third-rate performances here. What’s Jean-Claude van Damme doing in such an awful C-movie with probably no budget. I sincerely hope that they have returned the entrance fee of those who did the effort to go and watch it in the theater ! It really looked like a project of a student at the film school. I bet he failed his test with this anyway. The SF part is limited and the used effects look like a Star Trek episode from the 70’s. The first half hour we look at the social life of some young people in a club and in the bedrooms where they are nagging and whining endlessly about nothing. Next there is a general power failure across the UK and the next evening there is a peculiar light shining and a reverse boiler appears floating in the sky. The only positive thing I could come up with was the fight between Sean Brosnan and an infiltrated alien. Good advice: do not bother to watch this. It’s a complete waste of time and energy.